In some cases our clients ship such a volume of freight that Reilly Transfer Group becomes their outsourced delivery partner. Integrating in to our customers operation, we become their one-stop shipping solution. They eliminate the pains and expenses of owning and operating a fleet of vehicles and drivers, allowing more time to focus on their core business. Eliminate the need to own and manage fleet of trucks and delivery drivers. Enterprise software and dispatch system capable of integration and real-time asset tracking. 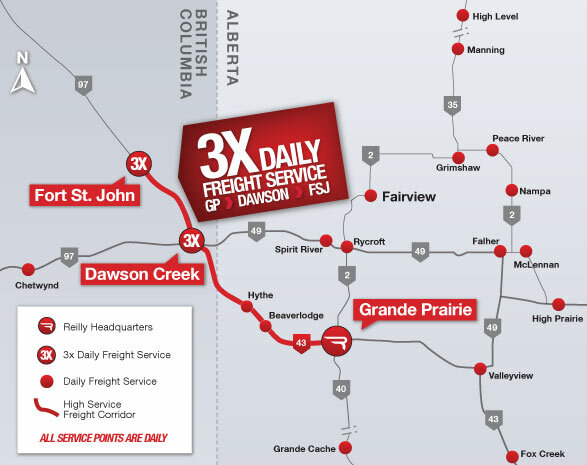 Lowest total cost by utilizing the peace region’s largest same-day delivery network.